This orgonite pendulum amethyst – crown chakra is a beauty. 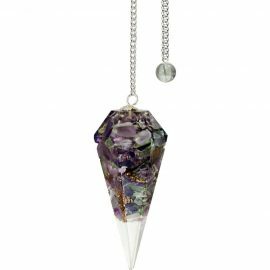 Our amethyst orgonite pendulum is made with metal chips, resin, quartz crystal and amethyst to correspond with the crown chakra. Orgonite pendulums clear the aura of harmful energies and awaken our inborn psychic senses. This awakening frees the pendulum to give insightful, balanced answers. Our carnelian orgonite pendulum is made with metal chips, resin, quartz crystal and carnelian to correspond with the sacral chakra. Orgonite pendulums clear the aura of harmful energies and awaken our inborn psychic senses. This awakening frees the pendulum to give insightful, balanced answers. 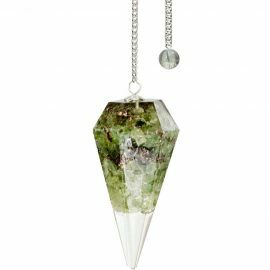 Our aventurine orgonite pendulum is made with metal chips, resin, quartz crystal and green aventurine to correspond with the heart chakra. Orgonite pendulums clear the aura of harmful energies and awaken our inborn psychic senses. This awakening frees the pendulum to give insightful, balanced answers. 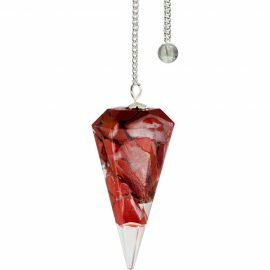 Our red jasper orgonite pendulum is made with metal chips, resin, quartz crystal and jasper to correspond with the root chakra. Orgonite pendulums clear the aura of harmful energies and awaken our inborn psychic senses. This awakening frees the pendulum to give insightful, balanced answers. 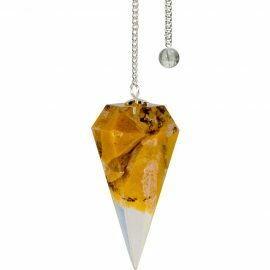 Orgonite Pendulum Yellow Aventurine – Solar Plexus Chakra. Our amethyst orgonite pendulum is made with metal chips, resin, quartz crystal and yellow aventurine to correspond with the solar plexus chakra. 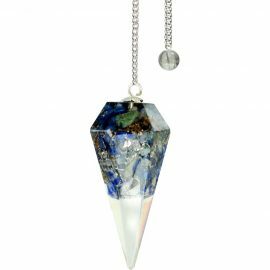 Orgonite pendulums clear the aura of harmful energies and awaken our inborn psychic senses. This awakening frees the pendulum to give insightful, balanced answers. 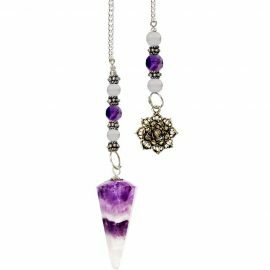 This pendulum – chakra chain curved amethyst has a chakra chain with 7 little stones all along the sterling silver chain. Good pendulum for chakra balancing. Amethyst has the ability to attract spiritual energies and provide peace of mind. Connecting with our Higher nature is the first step toward healing. 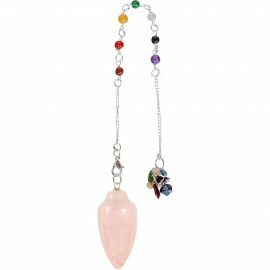 This pendulum – chakra chain curved rose quartz has 7 little stones all along the sterling silver chain. 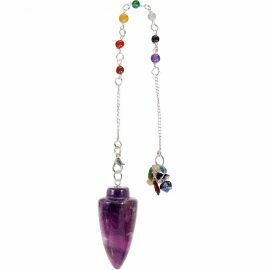 Good pendulum for chakra balancing. Rose Quartz is a calming and soothing stone, it brings gentleness and tolerance. The rose quartz stone is ideal for heart related questions. Rose quartz will help remove negativity and fear and replace it with love and harmony. How can these gemstone help you in your life? See the description below for a list of the physical, emotional, and spiritual properties of these gemstones. 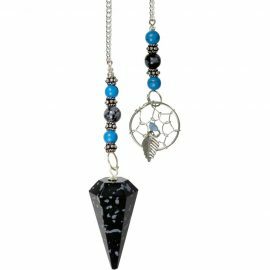 This a a special pendulum – selenite teardrop with chakra beads. 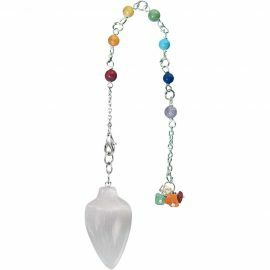 Made with white selenite, this pendulum features an attached silver chain with chakra colored beads. The lobster claw clasp allows the chain to be used as a bracelet with or without the pendulum. 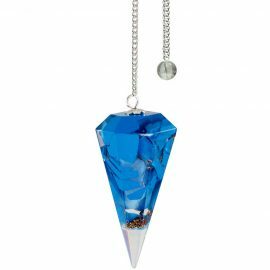 This is a good pendulum for chakra balancing.